Graphic novels are books written and illustrated in the style of a comic book. Although today’s graphic novels are a recent phenomenon, this basic way of storytelling has been used in various forms for centuries---early cave drawings, hieroglyphics, and medieval tapestries can be thought of as stories told in pictures. 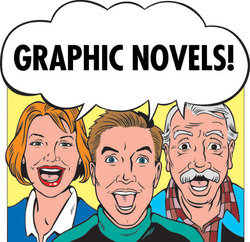 The term “graphic novel” is now generally used to describe any book in a comic format that resembles a novel in length and narrative development. and poetry can communicate on levels that on other storytelling can. Graphic novels combine all of these elements in their own unique way. They are like prose in that they are in a written printed format, but they are also like film in that they tell a story through dialogue, and through visual images that give the impression of movement. A graphic novel is different from a picture book because it uses words and pictures in multiple sequential panels per page to tell a story. Graphic novels tell a story through visuals and text. There are many ways to interpret what’s happening from panel to panel and page to page. Jeff Smith is best known for his graphic novel series BONE about three cartoon characters who find themselves in a strange fantasy world with monsters, princesses, and dragons. Smith also offers advice for young cartoonists, and talks about the importance of graphic novels in motivating reluctant readers.